We recently got an email from a reader of Bijli Bachao saying that he purchased an instant water heater after reading our articles. This made us think: did we ever recommend using instant water heater to people? The answer was NO. Were the articles written in such a way that it came out that instant water heaters were better? May be! So we thought of writing this article that can give our understanding and take on instant water heaters. There is nothing like buying instant water heaters/geysers is right or wrong, but with this article we will provide our take on instant water heaters and the impact of using the same. As we presented in our previous article: Choose the right sized water heater/geyser for electricity saving, it is important to choose the right sized water heater because the amount of electricity used by water heater depends a lot on the usage of hot water. The lesser the hot water used, the lesser is the electricity consumed. Also lesser the water you heat, lesser is the electricity consumption. Thus it is important to choose the optimum sized water heater that suffices your needs. The smaller the size better it is. Although smaller the size, higher will be the rating of the water heater. Also it is better to switch on the water heater before the use and switch it off immediately after. 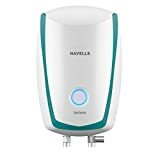 Looking at the suggestions above, instant water heaters come across as the most ideal solution as they do not have any storage (so no chance of heating extra water or wasting hot water) also they have to be switched on before use and switched off immediately after. The electricity unit consumption is apt and there is very less wastage. From an individual’s perspective it sounds great. Because the instant water heaters have to provide water at the desired temperature, the rate at which it draws electricity at any moment is very high. So a storage water heater may be rated at 2 kW, an instant water heater is rated at 3 to 4.5 kW. So if 15 liters of water is heated in both, although the units consumed may be the same, but because instant water heater heats it immediately, it draws more power from the system i.e. it puts more load on the system. Imagine a city where most people use water heaters between 7 AM and 10 AM in the morning and most water heaters are switched on during this time. If most of them are of 4.5 kW then the infrastructure required to handle the same will be huge and if the infrastructure is not there then grid failures (similar to the one happened in North India in 2012) can happen again. There will be sudden need of a lot of power. Instead if most systems are 2 kW systems, it may take time to heat water, but the system will not be strained. Personally for an individual, the connected load of the house will increase by 2.5 kW (4.5 – 2) and may cost additional money in terms of fixed cost. So the savings in energy cost may get transferred to fixed costs. We always recommend saving water and using lesser water for all purposes. More water is required if you take bath in shower or tub (about 25-30 lts), bathing using a bucket uses lesser water (about 15 lts). A 6, 10 or a 15 lts storage water heater is mostly sufficient for such use. 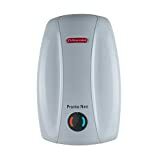 In places that are cold or extremely cold during winters, a 15 lts water heater may be sufficient, whereas in places where the room water temperature is not too cold, a 10 or even a 6 lts water heater may suffice. If water heater is to be used in kitchen and usage of water is less, a 6 or 10 lts storage water heater may be good enough. The intent should always be to heat optimum water to save electricity. Smaller water heaters also have smaller energy losses and thus provide ideal water heating. 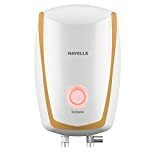 Please note that there are few models of 6 or 10 ltrs storage water heaters are also rated at 3 kW (and not 2 kW). These are again not recommended from power system point of view.